Output 5: How to create a roadmap on implementing sustainability green salon? Applying new techniques, implementing health & safety and environmental changes, bringing new products to the market? Start offering services? These are important topics that deserve a plan-based approach. There is a lot to look at when it comes to implementation. Complex issues touch on different aspects of the company. There is also the time pressure. The normal course of business, continue to serve the market and earn back your investment. How do you manage that in the right direction? For a practical approach you always have to make small steps that can be overseen. You do this by dividing the big goal into smaller goals and expanding them over time. You note these all in a so called “roadmap”. 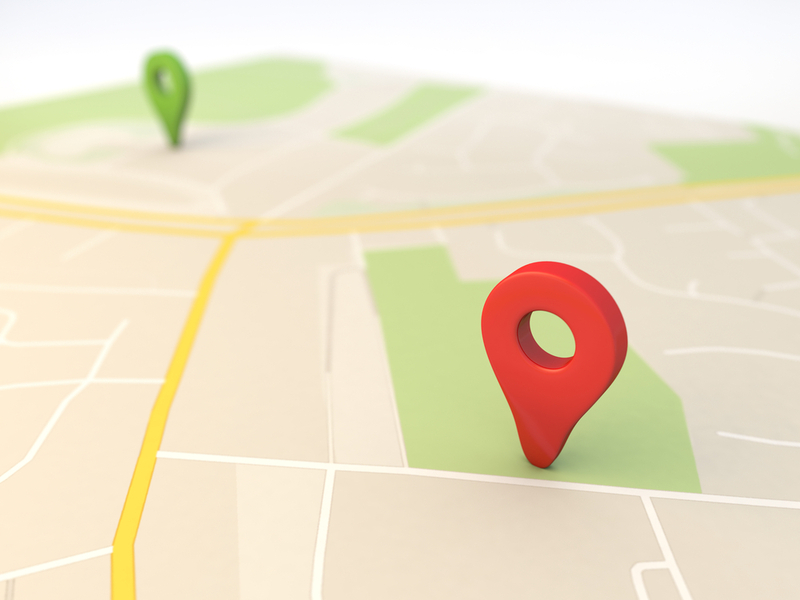 A roadmap is actually a development plan for your company. A plan in which both the activities and the time planning have been appointed. And the coherence of the activities among themselves. In the first instance, a roadmap provides clarity and insight to the employees of the company itself: 'What are we working on?' 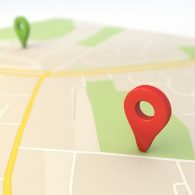 A roadmap also helps the entrepreneur to gain insight into (future) planning on different aspects. But do not underestimate the power of sharing the roadmap with customers and suppliers: they gain insight into the steps the company wants to take. It is good for customers to know what is coming and for suppliers to know what is expected of them in the medium term. A roadmap consists of 4 levels. You start at the end: namely the market introduction. For this you first have to implement the innovation, for example the introduction of the "Green Salon", improvement of sustainability through investments, the development of new services or the introduction of new products. In order to do that, new technology may be needed. And that is only possible if you use external expertise or if you have people with the knowledge and expertise. So there are also necessary aspects to arrange for suppliers, organization and information and training of employees. In short, if the roadmap is on paper, you will recognize a 'route' that runs from the lower left to the upper right, from the organization to the market introduction (see the blue arrow). By starting with what you want to mean for your customers (i.e. in the market), you keep your focus on creating added value for your customers. Important at this level is the 'why': 'Why do I want to introduce this, what problem does solve for my client?'. 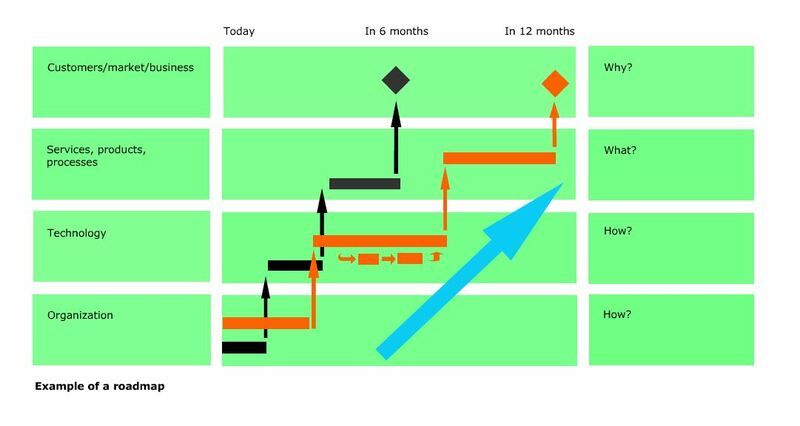 By subsequently determining when you want to introduce this (choose a natural moment, for example activity such as a fair or opening meeting), the first block (top right) is filled in on your roadmap. On the second level you define the 'what': 'Which products, services and processes will I develop that solve my customer's problem? And when?'. By assuming the lead time that the development has, the second block is on your roadmap. In this phase, also think of making investments, implementing changes in the salon, such as changing installations (water, energy, waste materials, etc. ), certifications and the like, in short, the development process. Often, new knowledge is also needed for the development of new services, the introduction of other methods and the introduction of new products. Namely the 'how' of these new products and services. This may involve new technology or perhaps new suppliers (which you then have to be able to reasonably assess, so it is necessary to build knowledge yourself). This, too, takes time and capacity. In addition to technology, knowledge and suppliers, you sometimes have to change your organization. For example, competence development among employees, hire new staff or create an organizational change. So 'what else is needed?' is the central question here. With this fourth level you will also arrive at the present day. And so you know what you have to do now for your goals of tomorrow. Now you have insight into the steps to take and time needed. Now you can see whether the chosen moment of introduction is real, whether you can release sufficient capacity and funding, or whether you have to arrange certain things differently. For example, outsource. In this way you arrive at a feasible plan. 'A roadmap is a living document and have to be regularly updated'. It is practical to make the roadmap with several people from the company. With a long piece of paper stuck horizontally on the wall and a stack of post-its, everyone can join. The advantage of creating together is that everyone contributed and lived through the roadmap. Everyone knows what to do and how urgent it is. Teamwork is created to actually realize the goals of tomorrow.